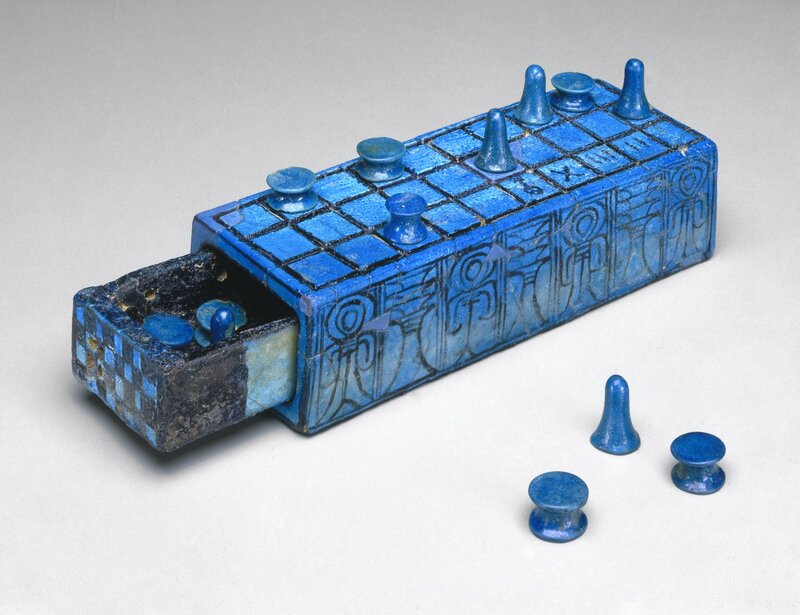 Okay, so to be fair, Senet might not be the first board game ever. But it is the oldest board game we know about. The earliest confirmed painting of Senet dates back to the Third Dynasty, in the tomb of Hesy (2686 – 2613 BCE). However, an earlier painting showing a scene resembling Senet appears in Merknera’s tomb (3300 – 3700 BCE). Senet is also seen throughout tombs of the Fifth and Sixth Dynasties (2500 BCE). Even the famous Nefertari (1295–1255 BCE) was a fan, as shown in the top image. Do you think she and Ramesses II and stay-home game nights? I hope they did. They deserve it. Senet (which translates as ‘game of passing’) stuck around through the New Kingdom (1500 – 1077 BCE) where it became representative of the journey of the the soul to the afterlife. Intact Senet boards were found throughout the Middle Kingdom, bearing markings of religious significance. The game is even referenced in Chapter XVII of the Book of the Dead! the Osiris among the revered before the great Ennead which is in the west, after he moors. Senet was undoubtedly very popular in its time. It made its way to neighboring areas and has been found in Arad (Isreal), Byblos (Lebanon) and Cyprus. Unfortunately, the exact rules of the game have been lost. Personally, I blame Julius Caesar for burning down the Library at Alexandria. The game board a grid of 30 squares, 3 rows of 10. The game has two sets of pawns, at least 5 of each. Senet Historians (which I’m voting for Greatest Job To Have 2018) Timothy Kendall and R.C. Bell have made their own reconstructions of the game. They base their rules on snippets which have been recovered over the years. Granted, for any game which spans literally thousands of years, the rules will change over time. Good question. There are a few rules which seem to remain consistent. 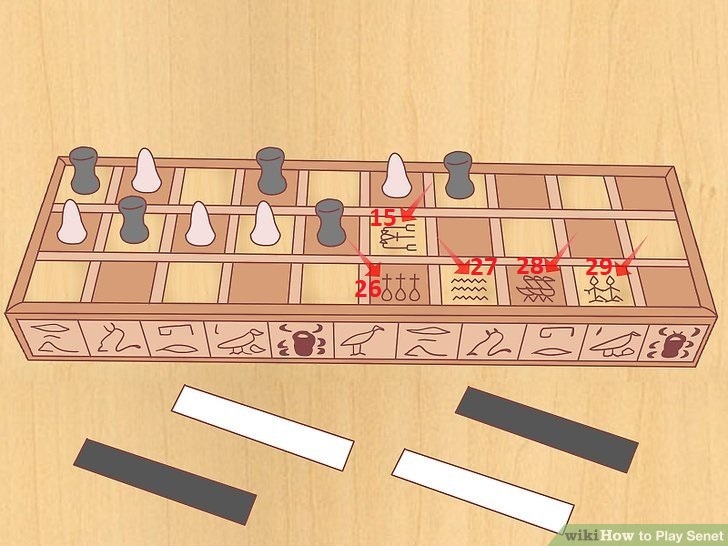 The Senet board is 3 rows of 10 squares (or Houses), which are numbered 1-10 on the top row, 11-20 on the middle row and 21-30 on the bottom row. Players set up their pawns alternating on squares 1 – 10. Then, players take alternating turns rolling Senet Sticks to move one of their pawns. Senet Sticks are flat sticks painted black on one side and white on the other. Players toss the sticks and move based on the ‘roll’. The various rule sets I found all varied slightly on how to move based on the roll, but often ranged from 1 to 6 squares, occasionally taking another turn on certain combinations. Pawns are moved consecutively through the numbered squares, essentially making a single row of 30 squares which the pawns must move through. Either way, the goal remained the same. Move all of your pawns off the board. If one of your pawns ever landed on top of an opposing pawn, the opposing pawn moved back to where your pawn started its turn. However, if the opposing pawn is adjacent to another of their pawn, those houses are protected and can’t be attacked. Additionally, houses 15, 26, 27, 28 and 29 were special. Again, rules vary but this is one set of rules I found regarding the special houses. House 15 (The House of Rebirth): When you reach this house, you must toss your sticks again. You cannot remove your piece until you toss your sticks and only one colored stick is facing upwards. House 26 (The House of Happiness): All of your pieces need to pass through this house to win. You must land on the house exactly. If you do not roll in such a way that you’ll move exactly on to that House you have to stay in place until your next turn. House 27 (The House of Water): If you land on the House of Water, you have to move straight back to the House of Rebirth. House 28 (The House of Three Truths): If you land on this house, you can throw your sticks again. If you have three color sides up, you can automatically remove this piece from the board. House 29 (The House of Re-Atoum): If you have land here, throw your sticks again. If you have two colored sticks facing up, you can remove your piece from the board. Overall, Senet seems very similar to Backgammon. Which is not surprising. Backgammon is just about as old. Excavations at Shahr-e Sukhteh in Iran have shown that a board game existed there around 3000 BCE. 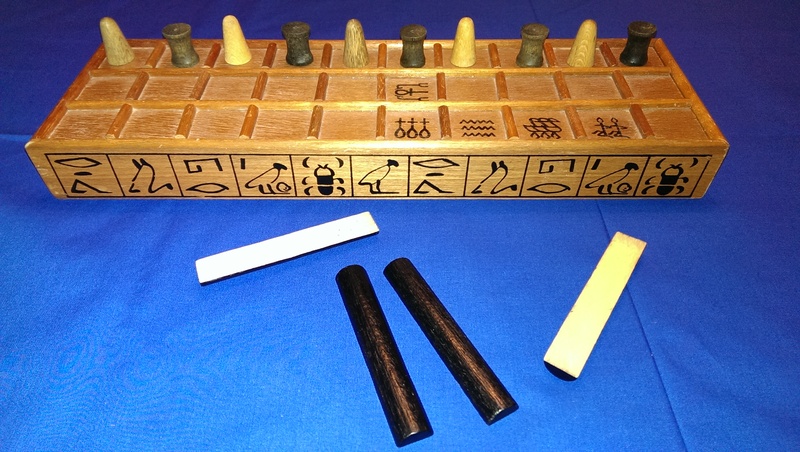 However, Senet still likely wins the oldest game award for having pieces found as far back as 3100 BCE and the hieroglyphics resembling Senet in Merknera’s tomb. Actually, because I know you’re curious, here is the hieroglyphics for Senet. 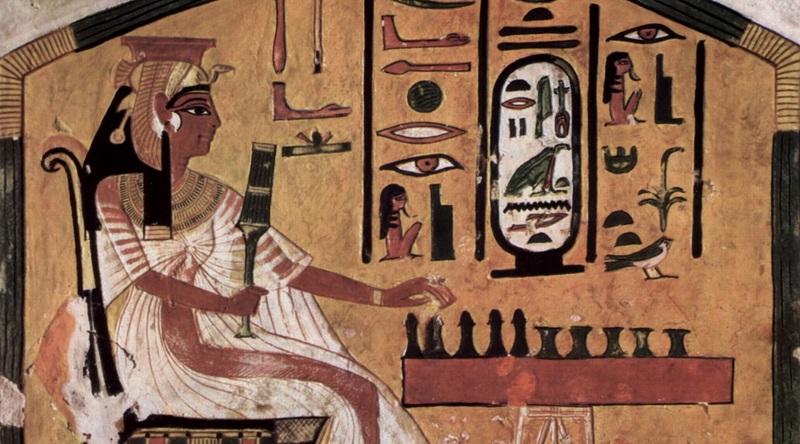 Anyway, whether or not Senet is the oldest or if it goes to Backgammon, Mehen or the Royal Game of Ur, one thing is for sure: Board games have been around for about 5000 years and don’t seem to be going anywhere. Which games of today, if any, will survive for the next 5000 years? Also, is it fair to tag this article as ‘retro’?